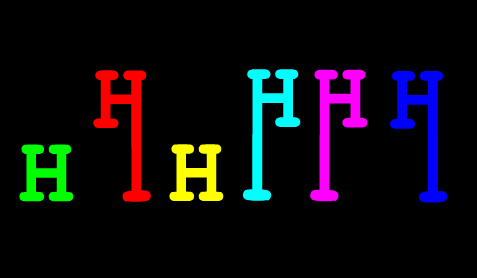 With this curious little poem, Ana María Uribe uses a simple modification of a row of letter H— extending the arms and legs of the letter H into ascenders and descenders (respectively)— to imbue them with life. The music and German-like orders barked at these letters make them seem like soldiers marching, exercising, and performing a drill all over the window space. There is tension between the individuality of each letter color and the sameness of each letter’s shape and motion, which that breaks down in the image above as the voice barking orders becomes increasingly frantic. Perhaps these letters aren’t just arms and legs and do have a head on their shoulders, after all.